When I was growing up, I had two passions: basketball and girls. I had no time for reading, I thought it was enough with old the classic books I had to read at school. I normally linked boredom to books. That was the reality, I’m sure it was because I was reading the wrong books at that time. One Sunday morning, my dad gave me money to go to buy bread and the newspaper and he handled an equivalent of 20 GBP note so reluctantly I went for it. I used to buy the paper in a small shop just 100 yards away from my home, that store was owned by one of my neighbours. When I asked for the paper, the girl at the till asked me “Do you want the book it comes with the paper?” I looked to the book and saw the name “The Rainmaker” by John Grisham. The name sounds familiar and the story sounded great so against all odds I said - “yeah, I’m taking it too”. That same evening I started reading that novel, I was hooked. Since that day, I love reading. No way back. John Grisham made me love reading. After that I have read many of his books. I loved them all. The last one I read was “An Innocent Man” and I stopped. I wanted to read other writers and suddenly I forgot about him. 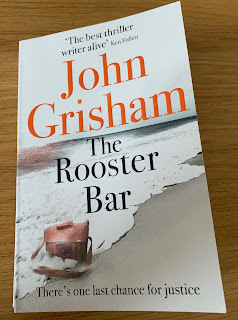 Couple of weeks ago, I saw one of his books “The Rooster Bar” and I decided to read him again. Before I started reading I went to my Goodreads account and checked the reviews. Some said “Classic Grisham”, “Loved it!”, others however said “Slow paced”, “Predictable and boring”. Who was right? In my opinion, the first ones! 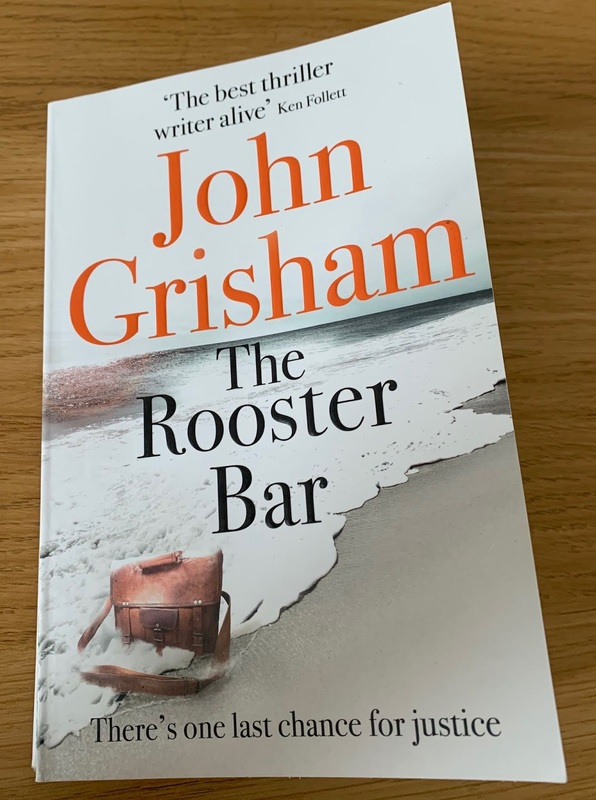 If you’re looking for a modern classic, a book with eternal twists, a novel with 300 characters and deaths all around the board, you simply don’t know who John Grisham is. The American writer will get you into a big social issue alongside 2 or 3 young, starving lawyers who will fight against a big rival in an uneven battle but their brains will beat their dollars and at the end they will run with the money. ‘The Rooster Bar’ dives you into the University for profit world, where students are lured into a University thinking about a bright future and only to know they are heavily in debt, the university scammed them with a poor education and they won’t be able to pass the bar, therefore they can’t work as a lawyer but they have to payback the university fees that could be as high as $250K. To recap, no bar, no future, no money, no life. These three student fight back the system posing as lawyers even before they graduated, a felony. In the other hand, Grisham points out the American Inmigration problem, especially how illegal immigrants are treated when caught. The drama of the deportation, and how affect them and their American family members. This is a touchy subject on today’s world. Throughout the three main characters you experienced first person all these problems on vintage Grisham style. I have enjoyed reading it, re discovering why I loved his books so much and now i’m more than eager to buy or get the other novels I had missed all these years. Do I recommend ‘The Rooster Bar’? Hell, yeah.